For the first time in my life, I didn’t go home for Christmas, so a certain young gentleman brought me home with him. It was a novel but very nice experience, to be welcomed in someone else’s home after years of doing the welcoming (my parents’ house tends to attract orphans and strays of the human persuasion). Ordinarily I would bring a gift of the single-malt persuasion, but S’s parents don’t drink. Once I brought them a gift box of Asian pears (S’s parents don’t eat meat) but learned from the puzzled looks that only Korean people do this. So I decided to make cookies. Since it was a holiday, I decided to make a variety of them. The next best thing about these recipes (after their deliciousness) is that the cookies are very good-looking. This is a top-secret recipe of my own devising. I’m not in the habit of devising recipes but I’m okay with sharing this one because (a) they’re really strangely delicious, and (b) I’m convinced that my scookies will turn out cuter, if not better, than yours. The scookie was a happy accident. I’d been on a scone-baking kick and wanted to branch out to cookies. I was trying to follow a sugar cookie recipe and ended up modifying it (not on purpose). As it turns out, I was only capable of baking things that resemble scones. 1. Whisk the dry ingredients together in a mixing bowl. Chop up the butter into small cubes and mix them, plus the wet ingredients, into the dry mixture. Don’t overmix — the dough shouldn’t be smooth — but combine until it becomes a gritty but cohesive batter. This takes muscle work. If you’re feeling lazy, I recommend getting another person to do this for you by flattering him about his upper body strength. 2. Put the bowl into the fridge and chill for 20 minutes or so. Meanwhile, preheat the oven to 350, or a bit lower (I have an energetic oven, but reducing the heat a little mitigates the fear of scorched scookies in any case). 3. Line a cookie sheet with parchment paper. Use a spoon to spoon out a small scoop of batter, then roll it in your hands to form a ball. How big? They can vary, but smaller than a golf ball or a ping pong ball. What they remind me of, size-wise, are the black balls they use to vote on things in fraternities and secret lodges (anyone remember that episode of ‘90210’ when they were trying to blackball Steve Sanders?). Bigger than a gum ball. You know. 5. Fill the cookie sheet. The scookies don’t expand too much so you can get quite a few on there. 6. Bake for 9-10 minutes. They will not change color but might get a little golden brown on the underside. Yield: Depending on the size of your scookies, 4-5 dozen. 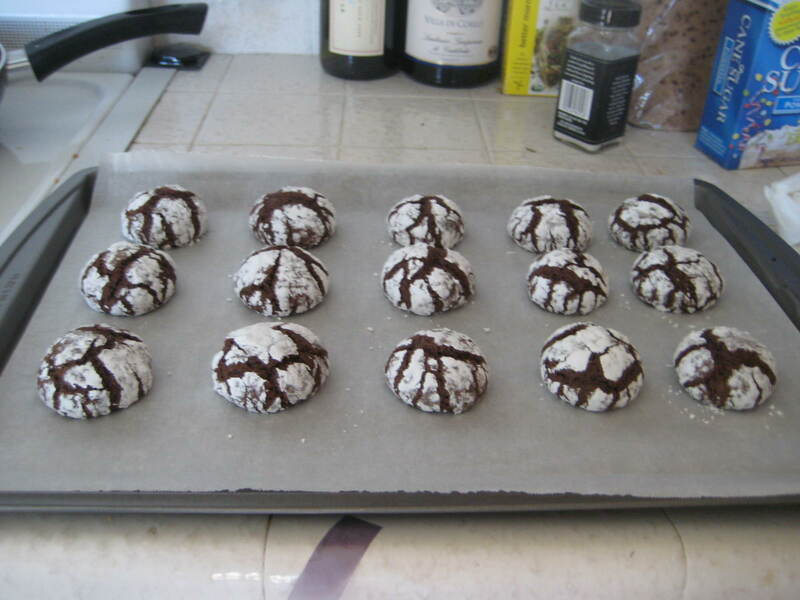 The other cookie I made was a small chocolate crinkle. I consulted Simply Recipes and followed that recipe to the t, so I’m just going to post the link, and a photo of the end result. I chose this recipe because the guest writer who contributed it said it was “easy peasy.” Luckily, it was. Here is the photo: isn’t this a handsome cookie? Also, I had no idea that a chocolate crinkle was a thing, but one of S’s cousins saw them and said, “What’s this? A chocolate crinkle?” so apparently it is. This happened at a dim sum restaurant the morning after Christmas with the extended family, when S’s parents unexpectedly whipped out the box of cookies I had made and passed them around to the general amusement. 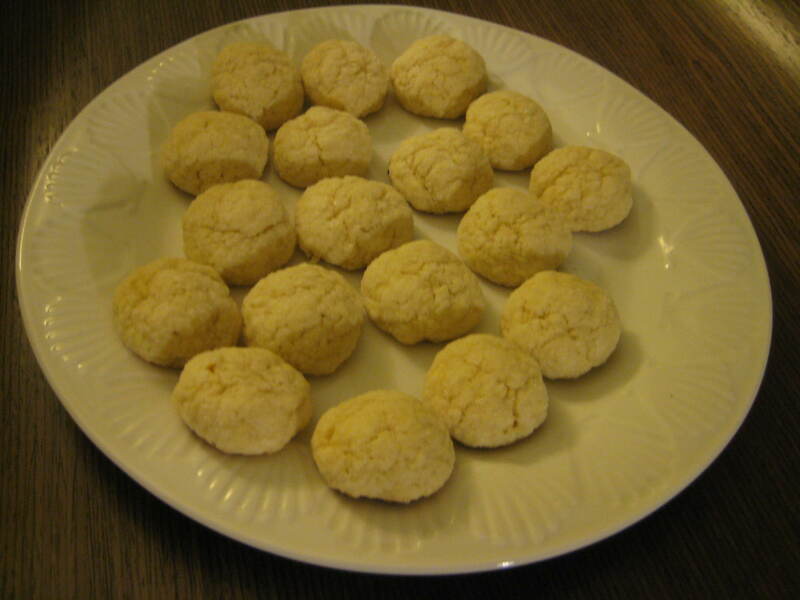 This entry was posted in Recipes, Uncategorized and tagged Christmas, cookies, scookies. Bookmark the permalink.